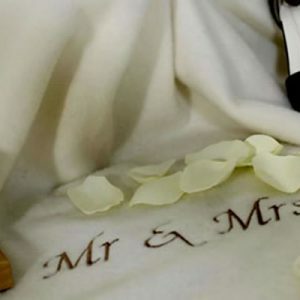 Our range of 215 gram Cashmere and Lambswool mix blankets are available in 4 sizes and in 2 colours; white and champagne. The mix ratio is 15% Cashmere and 85% Lambswool which is blended and finished with a Satin binding to produce that soft luxury feeling. John Atkinson of Hainsworth have created a beautiful super soft ‘Lambcash’ blanket by weaving Cashmere & lambswool together. These wool blend blankets are soft and lightweight, making them an ideal choice for snuggling under in bed or on the sofa. The wool and cashmere blanket is a luxurious home comfort and make excellent gifts for all occasions. Manufactured at the Hainsworth Mill in the UK, using a fine blend of 85% lambswool and 15% Cashmere. 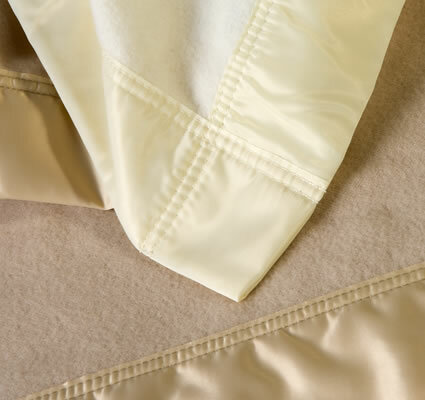 These beautiful super fine soft blankets are then hand finished with a coordinating luxurious satin binding. Looking for a significant wedding present? One of these John Atkinson cashmere and wool blankets are an ideal choice. All recipients will love them.